Our apple tree fell over this weekend. Its demise was not totally unexpected as it has been leaning more and more each year. It wasn’t a matter of “if” but “when”. Cameron and Matt spent a couple of hours yesterday chopping it up and removing the stump and, of course, picking apples. The tree went out with a bang, producing one of its best crops ever. We’ve never sprayed or treated the tree in any way and as a consequence we very seldom have many worm-free apples for snacking. 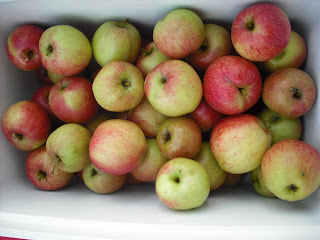 This year, however, we have plenty, in addition to the usual numerous blemished and wormy apples we use for baking. I spent a good part of today washing and sorting apples, then peeling, coring, and slicing those designated to the baking pile. In the past I’ve usually frozen the apples in unbaked pies and crisps but this year I decided to make pie filling for freezing instead. Unfortunately, I wasn’t entirely happy with the results. Even though I cut way back on the water, as suggested by a lot of people who’d tried the recipe (gotta love the internet), the end result was way too runny and I had to use a slotted spoon to transfer the filling to containers. I am hoping it will gel a little more once it is baked and cooled. Of course not all the pie filling was destined for the freezer—I had to try it out, didn’t I? 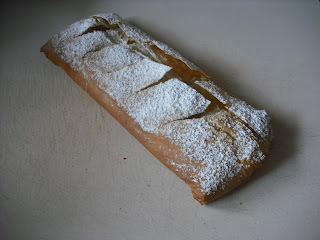 I baked some of it into an apple streudel and I must say it turned out very well, considering it was the first one I’d ever made. 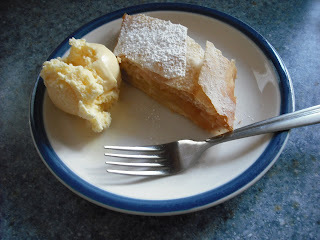 Served warm, with a scoop of vanilla ice cream, it made the perfect autumn afternoon snack.